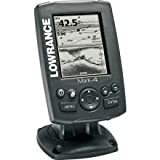 Overall, the Lowrance Mark-4 Combo Base Fishfinder and Chartplotter provides you a superb viewing ability through its wide-screen LED display. With the help of an ultra-accurate built-in GPS antenna and user-friendly features (including the easy-to-use menu controls and the quick-release tilt and swivel bracket), fishermen are entitled to a convenient experience of finding their prey in the water effortlessly. Do you find it embarrassing not to catch any fish after spending hours at the lake? Are you interested in owning a sturdy device for this because which is cost-effective too? Well, here is some good news for you. The Lowrance Mark-4 Combo Base Fishfinder and Chartplotter can serve as a great fish finder for locating your catch in the daytime. This device is handy, lightweight, portable, sturdy, efficient, cost-effective and whatnot. It enables the user to spot the right place for fishing by tracking the prey within a few minutes, thus, saving your time and energy. Finding a fish finding tool is probably one of the best decisions to make to facilitate your fishing hobby. The unit comes with a simple plug and play tilt and swivel mount, which can be easily moved and re-mounted to a trolling motor. Besides the adjustable viewing facility, this easy-to-install device also comes with intuitive controls that are designed in a way that the user can operate it easily with one hand while moving or doing anything else. Furthermore, the Mark-4 Combo Base Fishfinder and Chartplotter features a 3.5-inch screen with backlit LED that is easily readable even under the sun. The display also flaunts a unique trackback system which enables users to easily identify specific underwater objects through a detailed examination of sonar history by enhancing that area by 400%. The sonar technology transducer, on which the Lowrance Mark-4 Combo Base Fishfinder depends on, aims to locate fish and identify underwater structures. It works on a dual 83/200 kHz frequency and has the capacity to sweep till a maximum depth of 1000 feet. Apart from this, it includes an efficient GPS system which comes handy in waterways that consist of a lot of twists and turns. The feature allows you to reach your target and then navigate back to your starting point with ease. Moreover, the chartplotting feature helps you in marking your favorite spots so that you can return to them again, whenever the need be. Another plus point of this basic locator is that, it gives users the advantage of using a Fishing Hotspots map card in its microSD card slot. This compact fish finding gadget is ideal for small boats as well as for kayaks. It is not just simple to install, but easy to operate as well. Although, some people may not be attracted to its monochrome display, but the fish locating capability of this device is commendable. It is known for producing excellent images even on the grayscale screen.